To Cite: Koohsariyan A, Nasrabadi T, Zare M. Assessment of Sleep Respiratory Apnea in Cardiovascular Patients, Crit Care Nurs J. 2016 ; 9(4):e9759. doi: 10.17795/ccn-9759. Background: Sleep apnea is one of the respiratory problems during sleep and about 50% of cardiovascular patients suffer from sleep apnea. On the other hand, cardiovascular diseases are increasing in our country. Therefore, nurses working in critical care units should have a special approach towards sleep disorders of hospitalized cardiovascular patients. Objectives: This study aimed to assess sleep respiratory apnea in cardiovascular patients. 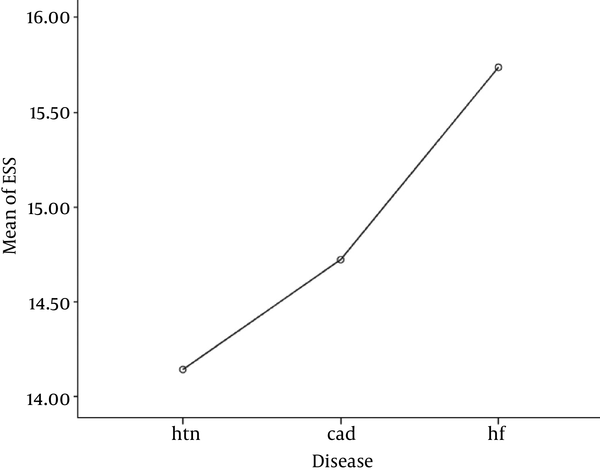 Methods: In this descriptive study, 76 cardiovascular patients were selected through random sampling from Baqiyatallah Hospital in Tehran, Iran, during 2015 - 2016. They were assessed in terms of respiratory apnea during sleep. A total of 51 patients finished review processes completely. The Epworth sleep scale (ESS ), which is a standard questionnaire, was used to assess sleep apnea. The subjective findings were assessed using the overnight polysomnography test. Data were analyzed using inferential statistics by the SPSS 19 software. Results: In this study, 66.7% of the patients were males and 33.3% were females. The mean age of the patients was 55.01 ± 12.1. The mean ESS score of the patients was 15.1 ± 5.1. 15. Ninety-two percent of the patients had sleep respiratory apnea. The mean score of sleep respiratory disorders of cardiovascular patients was 33.05 ± 4.6. The lowest score of sleep respiratory disorders was 3 and the highest score was 126.8. Conclusions: Sleep apnea during sleep is a common finding in cardiovascular patients. Therefore, the quality of life of these patients should be improved through timly assessment of cardiovascular patients’ sleep disorders. Also, nurses can be effective in decreasing complications and associated problems of these patients through assessing patients’ sleep pattern and referring them to clinics that assess sleep disorders. Avicenna had talked about sleep, its disorders and the impact of sleep problems on physical and mental health many times in his book called Canon of Medicine. He believes that the balance of sleep and wakefulness indicates temperament balance and specifically indicates brain good temperament (1). The differential diagnosis of sleep-wake complaints requires a multi-dimensional approach by considering the possibility of medical and neurological diseases simultaneously. The dominant disorders among these comorbidities include breathing-related sleep disorders, heart and lung disorders (congestive heart failure, and chronic obstructive pulmonary disease), degenerative nerve disorders such as Alzheimer disease and the musculoskeletal system disorders like osteoarthritis (2). Recent studies have indicatied a high prevalence of respiratory disorders during sleep. Unfortunately, despite serious consequences and debilitating complications, these disorders are ignored. Obstructive sleep apnea, which is developed gradually over the years are largely unknown. Findings related to the prevalence of sleep apnea have been achieved from the study of Wisconsin Cohort in America; the results of this study showed that 4% of middle-aged men and 2% of middle-aged women had sleep apnea. However, 80% to 90% cases of obstructive sleep apnea are undiagnosed. Despite limitations of methodology, many studies have shown that untreated obstructive apnea is along with increased disability and mortality (1). Lack of timely diagnosis can lead to a range of serious complications including increased systematic pulmonary hypertension, cardiovascular diseases, cognitive impairment and psychiatric symptoms such as depression, irritability and anxiety (3). Cardiovascular disease was the first cause of death in USA in 2008 (4). Due to different pathophysiological changes, which occur along with suffering from this syndrome, cardiovascular system also responds to this syndrome through several mechanisms. So that, prognosis of this disease is close to related cardiovascular events (5). Suffering from heart failure decreases an individual’s quality of life (6). Results of the study of Chen et al. (2009) have shown that 74% of patients with heart failure had sleep disorders (7). Before 1900, infection diseases and malnutrition were the most common causes of death in the world and cardiovascular diseases were the causes of less than 10% of deaths. In 2010, cardiovascular diseases were the cause of 30% (16 million) of the death rate in the world, this amount is close to 40% in high-income countries and it’s about 28% in low and middle income countries (8). An obstructive sleep apnea syndrome increases the 24-hour blood pressure. Increased blood pressure (at least 4 - 5 mm Hg) is seen in patients with recurrent nocturnal hypoxia (above 10 mm Hg) and also in patients who suffer from above 20% oxygen desaturation in arterial blood during sleep hours. Epidemiologic data in the normal population indicate that an increased blood pressure can increase myocardial infarction risk to 20% and stroke risk to 30% (1). Considering a high prevalence of cardiovascular diseases and high negative consequences due to lack of timely treatment of this group of diseases and also considering recent findings, the present study aimed to determine the prevalence of sleep apnea in cardiovascular patientsAlso, nurses of critical care units should have a special approach towards disturbed sleep patterns of cardiovascular patients during taking care of this group of patients. In this descriptive cross-sectional study, 78 patients with cardiovascular diseases were selected by the simple random sampling method from the sleep clinic of Baqiyatallah (AJ) hospital during a period of one year (July 2015 - July 2016). Considering test conditions and stages and inclusion and exclusion criteria, finally 51 patients finished review processes completely. Inclusion criteria for these patients included having cardiovascular diseases, a history of coronary artery disease and abnormal heart echo, high blood pressure and history of hospitalization. Patients who were under treatment and were using cardiovascular drugs were also included. The patients were referred to sleep clinic on an outpatient basis. Other inclusion criteria included absence of chronic respiratory diseases at the same time, chemical injuries, addiction to drugs, neuromuscular disorders and congenital heart disease. Initially, the Epworth sleep scale (ESS), which is a standard questionnaire, was used to assess sleep apnea. This questionnaire includes 8 multiple-choice questions; score above 10 indicates daytime sleepiness and sleep disorder. Afterwards, the patients were prepared for the polysomnography test and were under the overnight polysomnography test after necessary arrangement. In this regard, it was required for the patients to be present in the hospital and sleep testing center for about 12 hours. The results of the polysomnography test were analyzed and then were assessed by the sleep fellowship physician. Data were analyzed using inferential and descriptive statistics by the SPSS 19 software. The mean age of the patients was 55.01 ± 12.1. The youngest patient was 23 and the oldest one was 79 years old. In this study, 66.7% of the patients were males and 33.3% of the patients were females. Twenty-seven percent of the patients had hypertension, 35.3% had the coronary heart disease and 37.3% had heart failure. The mean BMI of the patients was 33.6% ± 6.2. Also, the lowest BMI was 22.1 and the highest was 53.7. Table 1 shows the mean ESS scores in three groups of the patients and Tables 1 and 2 show the mean scores of the apnea-hypopnea index (AHI). Abbreviation: ESS, Epworth Sleep Scale. Sleep apnea means cessation of breathing during sleep above 10 seconds. There are three apneas; it can be obstructive, which means it is due to upper airway obstruction, it can be central, which means it is due to brain problems and also it can be mixed. This disease is one of the causes of disability and death around the world and also it is one of the most common medical causes of sleepiness during a day. In addition, it is an important social issue (9). Sleep influences reconstruction of physical and emotional power. A healthy person’s heart beats 70 to 80 times per minute when he/she is awake; it is while heartbeat decreases to 60 times per minute during sleep. Therefore, sleep may be useful in maintaining heart performance (6). Nowadays, cardiovascular disease is one of the most common causes of death in the world (8). The results of the Moradi et al. study have shown that there is a significant relationship between sleep quality and different dimensions of life quality related to health in social performance, symptoms of disease, life quality and dimensions (10). Obstructive sleep apnea decreases daily activity and life quality (11). From a total of 51 patients, only 5 patients had a score below 10. The results showed that the mean sleepiness scores of these patients were above 15, which were high and showed daily sleepiness and sleep disorders, and this score was slightly higher in patients with less heart failure. This finding is in consistent with that of the Aslani et al. study; they reported that the prevalence of sleep disorders is 51% in patients with heart failure (12). Also, it is in accordance with the study of Chan et al. ; they stated that sleep quality of 70% of the patients, who are suffering from heart failure, is not good (7). On the other hand, in this study, the AHI was in the severe range, which confirms the correction of questionnaire data. The mean values of the AHI in hematic, heart coronary and heart failure patients were 28.1 ± 7.5, 42.1 ± 9.9 and 26.2 ± 6.02, respectively. Totally, the mean AHI of the cardiovascular patients was 33.05 ± 33.05, the lowest AHI score was 3 and the highest AHI score was 126.8. The findings of the current study show that the AHI in cardiovascular patients is in an extreme range and it is in accordance with the results of the Mozafari et al. study (13). Mozafari et al. study indicated that 61.7% of the patients had the AHI above 15; in our study, 74.5% of the patients had the AHI above 15. Also, in Mozafari et al. study, 81.7% of the patients had the AHI above 30, which was 50% in our study. The results of the present study showed that there was no significant difference in the AHI among the three groups of the cardiovascular patients (P > 0.05). This study included some limitations. At firt, racial, ethnic and cultural differences can influence the questionnaire completion. The high cost of the polysomnography was another important issue. Also, change in the conditions of insurance support of the sleep test by the insurance agents from being free to cash payment influenced the sample size. Sleep apnea is a common finding in cardiovascular patients. Considering the high prevalence of sleep apnea in cardiovascular patients, their quality of life should be improved by paying more attention to their sleep status and sleep disorders’ treatment. Therefore, early assessment and prompt treatment of sleep disorders in cardiovascular patients are recommended and the medical staff can help improve their quality of life and decrease the death rate due to these disorders. Also, nurses working in critical care Unit can improve the quality of life of these patients through assessing patients’ sleep model by the EPWORTH scale, which is a simple and cheap method. This study is a part of MA dissertation, which was performed with the cooperation of the sleep disorder assessment ward of Baqiyatallah (AJ) hospital. We would like to thank dear lecturers of Azad University of Tehran Medical Sciences Branch and Baqiyatallah (AJ) Medical Sciences University. Authors’ Contribution: Amin Koohsariyan, data collection and drafting of the manuscript; Tahereh Nasrabadi, supervision, drafting of the manuscript and critical revision of the manuscript; and Mohammad Zare, data analysis and drafting of the manuscript.